Who Has Access To Max Baucus? Senate Finance Committee Chairman Max Baucus has the clout to determine winners and losers in the health-care debate. Several former staffers are now industry lobbyists with a unique brand of access to the man at the debate's center. In Washington, access is money. Who Has Access To Max Baucus? Max Baucus is the nexus of dozens, even hundreds of interests in the health-care bill. In Congress since 1975, he's learned how to build relationships and how to leverage them. Baucus described his methods last spring, in a talk hosted by the Kaiser Family Foundation. His words came tumbling out in bursts and sentence fragments, as they often do: "Lots of meetings with outside groups, lots of on-the-phone, a couple [or] three times a day with groups, consumer groups, with labor, with industry groups, and finding out, 'Gee, what do you think about this? What do you think about that?' And just trying to put the pieces together." He said he uses his leverage to spur interest groups into debate rather than conflict. "Hold off judgment. Suspend judgment at least for 15 minutes," Baucus said. "Try to see if there's a way to get to yes. Think about it. There might be a positive angle here." But the relationships nurtured by Baucus go two ways. Every one of those groups has its own agenda first in mind. Paul Blumenthal, a writer for the nonpartisan watchdog the Sunlight Foundation, mapped Baucus' network of influence. (You can see the "Baucus influence map" at left). "We have Max Baucus, who represents a single node, as the chairman of the Senate Finance Committee," Blumenthal explains. On his computer screen, lines radiate from Baucus to five of his former Senate staffers. Two of them served as chief of staff to Baucus, the top job in his Senate office. All five now lobby Congress for various interests. Among their clients: drugmakers Wyeth, Merck, Amgen and AstraZeneca, plus the third-largest corporation in the world, Wal-Mart. "In Washington, relationships are part of the huge game of influence," Blumenthal says. "If you don't have a relationship with someone on the Hill, then you aren't going to have the kind of access that you need for your client." And so, he says, these lobbyists — and their clients — have a unique brand of access to one man at the center of the health-care debate. 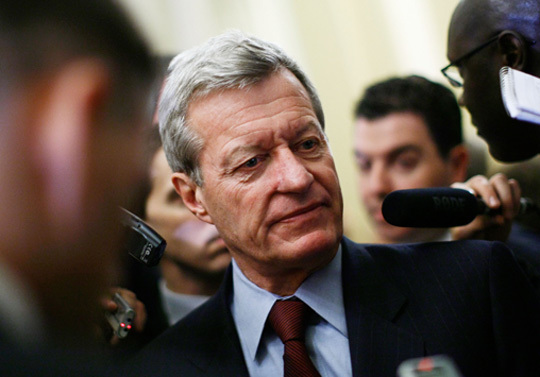 Backing up the access is money — and that puts Baucus at the heart of Congress' ethical conflict. Lawmakers have two constituencies: one, the voters back home; the other, the people and interests that finance much of their re-election campaigns. These donors often live out of state. When Baucus ran for his sixth term last year, his campaign raised $11.6 million, according to the Center for Responsive Politics. Nearly half of the funds came from out-of-state donors, including millions from health care and other industries overseen by Finance and Baucus' other committees. Just 5 percent of Baucus' re-election funds came from Montana donors. Just to compare: Sen. Mary Landrieu of Louisiana, another Democratic senator seeking re-election in 2008, raised almost half of her money in-state and slightly more than half out-of-state. The fundraising balance for Baucus tips even more sharply when his personal "leadership PAC" is factored in. The committee, called Glacier PAC, raises money to pay for Baucus to travel, raise his political profile and support other Democrats. Over the past six years, Glacier PAC raised 76 percent of its funds from political committee ties to corporations, unions, trade associations and lobbyists. 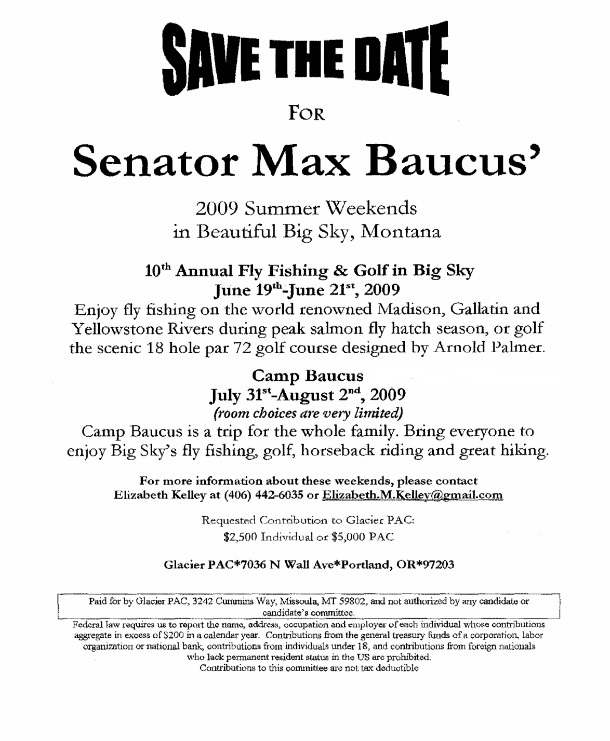 Baucus courts these inside-the-Beltway donors by inviting them to Montana for weekend getaways — skis and snowmobiles in February, fly fishing and golf in June, and coming up on July 31, "Camp Baucus," which is billed as "a trip for the whole family." So as Baucus and other lawmakers attempt to craft a bill that can smash through a virtual gridlock of interests, the awkward question lingers: To whom are they more attentive — their voting constituencies back home or the dollar constituencies who are at the Capitol every day? In the audio version of this story and in a previously published text version, we said 13 percent of Sen. Max Baucus' re-election funds came from Montana donors. That number should have been 5 percent.